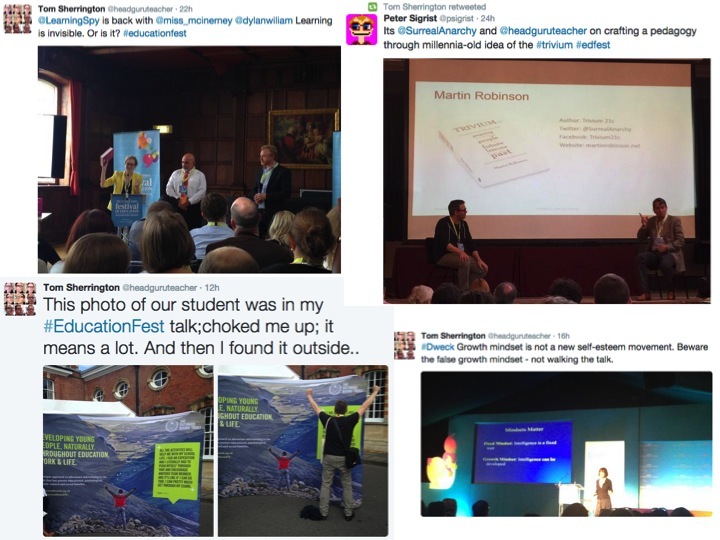 Festival of Education 2015: Ideas, people, emotions. #PassOut. I had a great day at Wellington. It’s been a super-tough week at work and this event has become my annual headspace day. 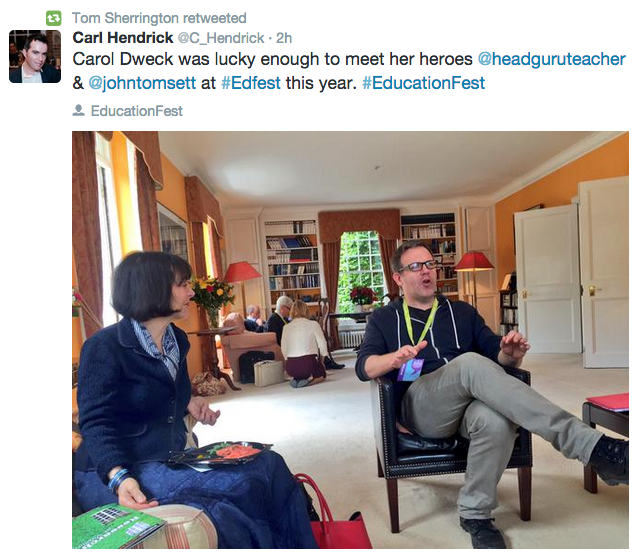 Thanks so much to David James for organising it for inviting me – again. It’s a magnificent festival. 1. 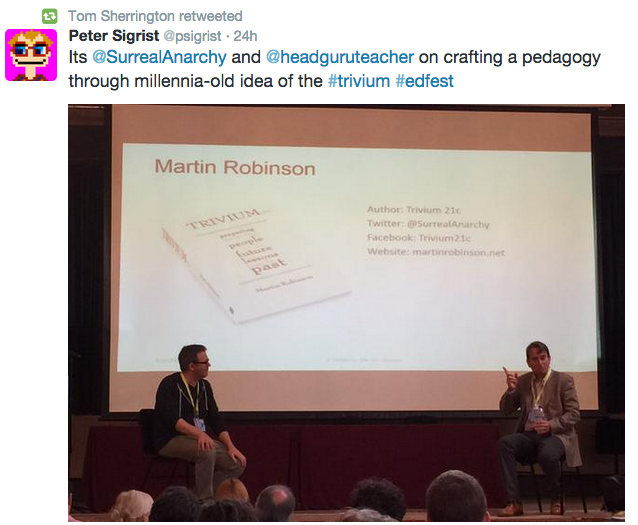 The Trivium comes to Highbury Grove. It was a thrill to present this with Martin Robinson, telling the story of our work together this year. Here are the slides. Thanks to everyone who came along to support and for the lovely feedback. 2. 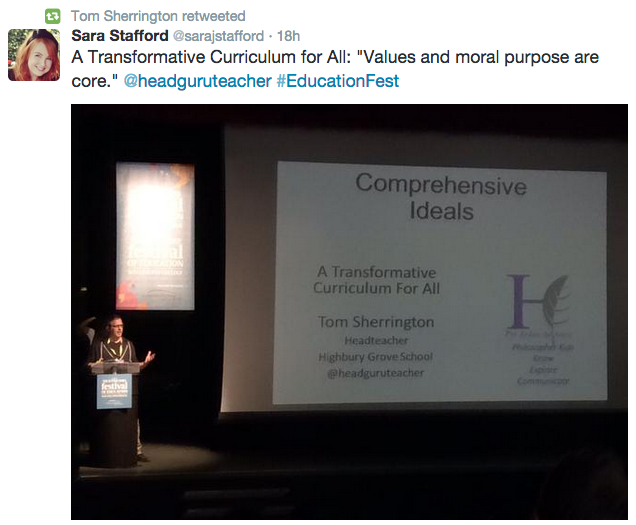 Comprehensive Ideals in the Curriculum. This was meant to be my main slot – and I’m grateful for all the people who came in out of the sun and away from the Tempah vibes to listen to me walk through my views on what the curriculum should include for all students in a truly comprehensive school: Academic learning, arts, outdoor education, cultural capital, personal development – everything. It was a bit of a broad sweep linking the details of our curriculum to the bigger mission – with a big plug for the emerging National Baccalaureate. Ebacc for All. Shackles on or off? 1. We need to drive school improvement through improving teaching and do this by focusing on better CPD and very simply, more CPD – so that teachers have time to learn, deliberately practice and reflect. CPD needs to build on or generate alignment with teachers’ values and pedagogical biases if it is to succeed in changing practice. A Head’s job is therefore crucial in building consensus around values and biases rather than imposing or forcing things. Teacher differences are bigger than school differences – and teachers have a role in supporting each other through open professional discourse, facilitated through school structures and open doors. 2. Teachers need to engage with research and evidence in a way that gives them a more profound understanding of how their students learn and behave so that, in the flow of the teaching process, their instincts and judgements are built around solid foundations of pedagogical wisdom – some of which may have originated in distant research trials, some of which will be built on their own experience. This is as close as we’ll get to a meaningful analogy with medical research and practice. It’s necessary and wise to strike a balance between thinking of students as individuals with different needs and learning preferences – and thinking of them as the same with a great deal in common. 3. Changing mindsets through interventions is possible and powerful but we need to acknowledge our own fixed mindset tendencies; false Growth Mindset is real; we can kid ourselves, talking the talk but not walking the walk. Teachers need to embrace growth mindset thinking before we have a chance of effecting significant change through psychological interventions with our students. 4. Dylan Wiliam has some issues with Lesson Study; I’m a huge fan – it’s such rich professional learning – but if DW raises a flag, it pays to listen so I’m going to explore this further. The best part of any festival is always talking to people in between the events. There are too many to list here but it was lovely to see you all. It was particularly good to meet Tom Starkey (@tstarkey1212) who has a refreshing groundedness about teaching and parenthood. Of course it all matters a lot – but we are all human; Tom is good at keeping it real. Just beginning to hear about the National Bacc. And will now have to take a look at Trivium. As a Humanities and English teacher the philosophy here is very similar to my own teaching philosophy. I’m really intrigued by your assignment outlines. They look more like mini-units then individual assignments. I like the opportunity for students to see their goals and a place for the teacher to give feedback. I’m curious though. Are their grades or levels in the National Bacc or just meeting of objectives?